On Friday I spoke on the very first motion of the Conference, putting forward Labour’s ideas to deal with unemployment. You can view the video by clicking here. On Saturday, a debate on the economy took place and I had an opportunity to speak on the motion. You can view this video by clicking here. Some of the most lively speeches were reserved for the debate on Labour’s 21st Century Commission report. I spoke in favour of the report on Saturday afternoon and you can see this by clicking here. A part of this speech was also featured on Sunday’s edition of The Week in Politics on RTE1. The programme is now available online and you can see it again by clicking here. You don’t need me to tell you that fear and uncertainty stalk the land. The recession is dealing a body blow to the labour force. Jobs are being lost at the rate of a thousand per day. Long queues have formed outside social welfare offices. Community welfare officers struggle to cope with the needs of an ever expanding client base. A client base of people who studied hard, who trained hard, who worked hard. And who paid their taxes in a diligent and timely fashion. Yes, paid their taxes without resorting to scams or schemes like our home-grown “Masters of the Universe” whose venality, dodgy dealing, incompetence and ‘crony capitalism’ have brought us to where we are today. And guess who has now come out against crony capitalism? A certain “Brian Lenihan” was railing against crony capitalism in the Financial Times last week. Could this possibly be the same “Brian Lenihan” whose party has elevated cronyism to an art form? For God’s sake, Brian: Fianna Fail, invented cronyism. You know of no other way. It is your life-blood. With Fianna Fail you are either in the tent or outside the tent. You can try and fool the FT but you can’t fool the people, Brian. Just because the Galway tent has been given the Biffo Boot doesn’t mean you have changed your ways. For as long as FF control the corridors of power, we can never put an end to crony capitalism. But put an end to it we will! It is the Labour Party, and the Labour party alone that will defeat crony capitalism. Delegates, I ask you to support this motion which outlines positive, proactive strategies for improving access to employment supports, education and further training. 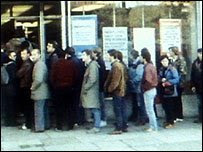 The Labour Party stands for equality of opportunity and not “jobs for the boys”; the Labour Party stands for equality of outcome, and not a system that confines whole groups of young people to McJobs; the Labour Party stands for programmes that work in favour of the collective good, and not a system that seeks to pit workers in the private and public sectors against each other. Last night, my colleague Cllr Paddy Cosgrave and I met with a group of local people from the Whitechurch area of Dublin South. It was an opportunity for those in the community to come together and discuss problems that are occurring at local and national area and where possible, myself and Paddy sought to accommodate those concerns. It was a successful evening with topics such as local parking and refurbishment coming up for discussion as well as issues such as pay for TDs and Senators and the cumbersome way the grant system works. This is only the first of quite a number of public meetings we plan to do in the constituency in the run up to the local elections and, of course, the Dublin South by-election on June 5. Keep an eye on the blog for further updates. Tonight in Whitechurch, in the local National School – Scoil Mhuire, sees the start of what I hope will be a series of community engagements across Dublin South. These meetings are about creating an opportunity for me and our local councillors, Paddy Cosgrave is our councillor for the Rathfarnham ward, to listen to the concerns and learn from the ideas local people have on how we’re doing right now as a community, an economy and a society. If you know of anyone who lives in the area, or indeed, if you fancy coming along yourself, then why not let them know that we’ll be there from 8pm. I was on the panel for The Sunday Supplement on Today FM at the weekend. My fellow panellists were Lucinda Creighton TD of Fine Gael and UCD lecturer Moore McDowell. The programme was dominated by the events in Antrim the previous night. Politicians – part of the problem or part of the solution? As we struggle to come to terms with the severity of the recession, people are entitled to ask what difference politicians can make; or what difference politics itself can make. I wonder whether we are deluding ourselves that our democracy works at all. We seem to have lost sight of the promise of politics and the value of collective action. In recent years success has been measured solely in terms of individual achievement. Even the practice of politics proved susceptible to this trend. But there are limits to the ideology of individualism. Instead of a collective approach to the provision of quality healthcare, childcare, education and care of senior citizens on the basis of need, irrespective of income, we have opted – often by default – for inequality and second-rate public services. All of this has become obvious now as we rub our eyes after the mirage of the boom. At the same time as income taxes were being reduced, the concept of public provision was being quietly eroded by the political ideology of individual provision. In effect what the government was saying was “every man for himself”, making it all the harder now for them to appeal to our collective consciousness. But when did we make these choices? In which election did we vote to abandon the principle of solidarity and collective provision in favour of a creed of “greed is good”? In my view, the economic crisis is not the only challenge we face. We face a destructive crisis of confidence in our democratic system. The political system failed us during the so-called boom years. With few exceptions, the Dail did not provide a forum for real political debate about the economic choices we should make, and the kind of society we saw fit to create. A forum of debate was reduced to a chamber of silence. A place where the less said the better if you wanted to safeguard your electoral prospects – an approach memorably endorsed by the former Taoiseach Mr Ahern, who saw electoral politics as all about “getting in and staying in.” It’s hardly surprising then that so many people see the Dail as an exclusive club, whose members are pre-occupied with electoral survival above all else. Perhaps the worst manifestation of how sick our system has become has been the needless expansion in the number of Ministers of State, each of whom enjoys the support of civil servants to “mind” their constituencies. In what was a telling justification of this excessive indulgence, Minister of State John McGuinness defended the practice on the grounds that Ministers are the “A&E ward of Government departments”. “We pick up all of the pieces that are simply not functioning”, he added. This very neatly sums up our predicament: Ministers of State, many without any clear executive responsibilities, using public resources – taxpayers’ money – to shore up their constituency profiles and, by extension, their electoral prospects. This is simply not acceptable in a democracy – to say nothing of the enormous cost involved. Surely the answer to a non-functioning system lies in reform of the system itself, rather than substituting this questionable and self-serving “A&E ward” for proper government? This kind of ‘politics as usual’ has to be challenged. It has to be changed. We need to review the system of multi-seat constituencies, which fosters senseless competition within political parties and encourages clientelism. We need a radical reassessment of the value and function of all of our political institutions, including Seanad Eireann. The banking crisis has exposed the lack of any meaningful parliamentary scrutiny of financial and economic matters. We should renew and strengthen our Freedom of Information laws, and include every single area of public administration and governance, allowing for exceptions only on the most compelling grounds. The current system of local administration must be replaced by a real and responsive system of local government. New technologies offer a real opportunity for expanding access by citizens to policy-making and public debate. Political parties too have a responsibility to re-articulate and justify their policy platforms for the modern era. Again and again voters tell us that they struggle to differentiate between parties on policy grounds – especially between Fianna Fail and Fine Gael. Debate and even sharp disagreement between political parties is crucial to any democracy. But where their differences are rooted in forgotten contests, clearly the voters are not being presented with meaningful choices. It is not enough to bemoan low participation rates and decreasing voter turnout. When we do this, or when we talk about the widespread lack of respect for politicians and the political process, we must come up with answers. A radical renewal of our democracy is necessary. If people believe that the system is dysfunctional, then it is dysfunctional, and there is little point in politicians complaining that they are misunderstood. I believe that we should act quickly to address these critical issues. We could do it through a radical programme of Democratic Renewal which would include a series of proposals for constitutional change. All of this should be subject to the widest possible public engagement and participation. Politics is far too important to be left solely to the politicians. I believe that we can grasp this opportunity to turn the prevailing despondency, apathy and contempt for politics into positive political engagement. And such an initiative should not have to wait for the economy to turn around. It should begin now. It need not be a partisan exercise. And it might just mean that politics and politicians (the current crop and those to come) really could become part of the solution, and not part of the problem.